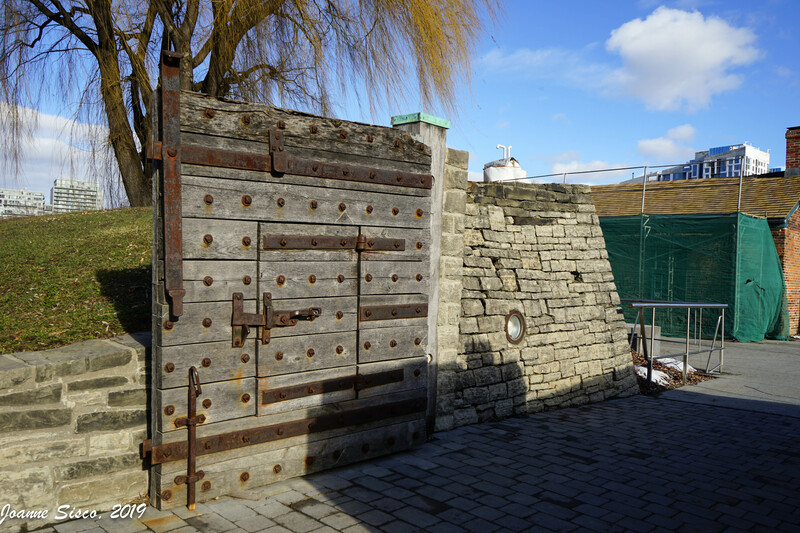 Last week on Thursday Doors I introduced you to Fort York, built in the late 1700s to defend what is now Toronto from a potential invasion – which was ultimately proved to be a wise decision. 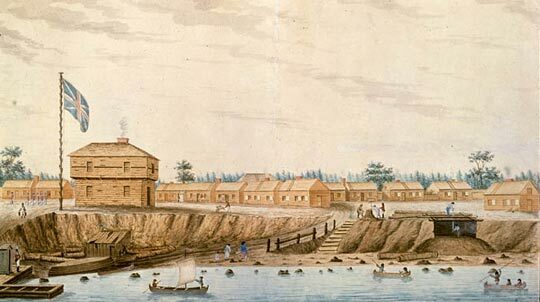 Lady Simcoe has been credited with making many sketches of early York (now Toronto) and I’ve always puzzled over the image of the settlement sitting on a high cliff overlooking the shores of Lake Ontario. The image is simply out of synch with the current landscape of the city and Fort York’s location within it. 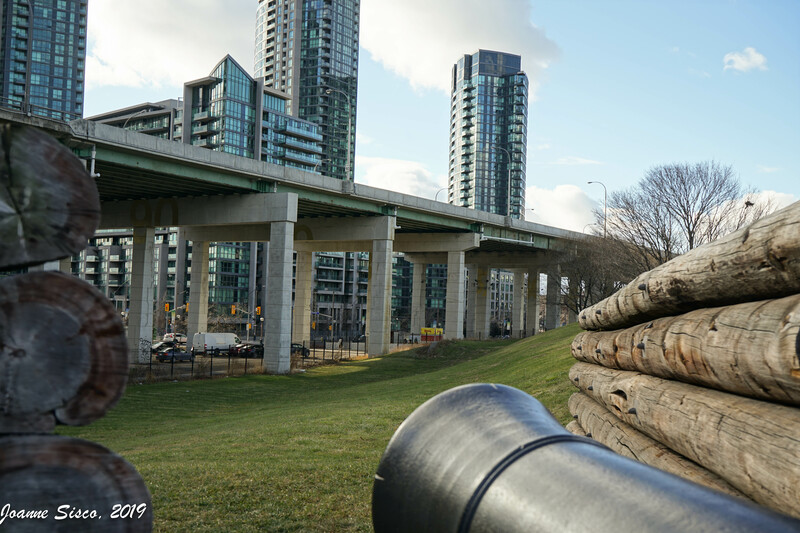 The south cannons of Fort York are now trained on … the Gardiner Expressway? Fort York now sits on a gently sloping hill about a kilometre (2/3 of a mile) away from the shoreline. The Gardiner Expressway is currently located where the shore would have been. I knew that a considerable amount of downtown Toronto had been built on manmade land, but until now I never had an appreciation for exactly how much landfill that really meant!! Meanwhile, back at the Fort, I continued my solitary exploration of the site. The original buildings are plain in appearance and had in fact been wooden structures, however today, they are a combination of wood and brick. My favourite building had to be the officers’ quarters. They certainly lived with a much higher standard of living than the regular soldiers – although to be fair, they paid for those amenities themselves. 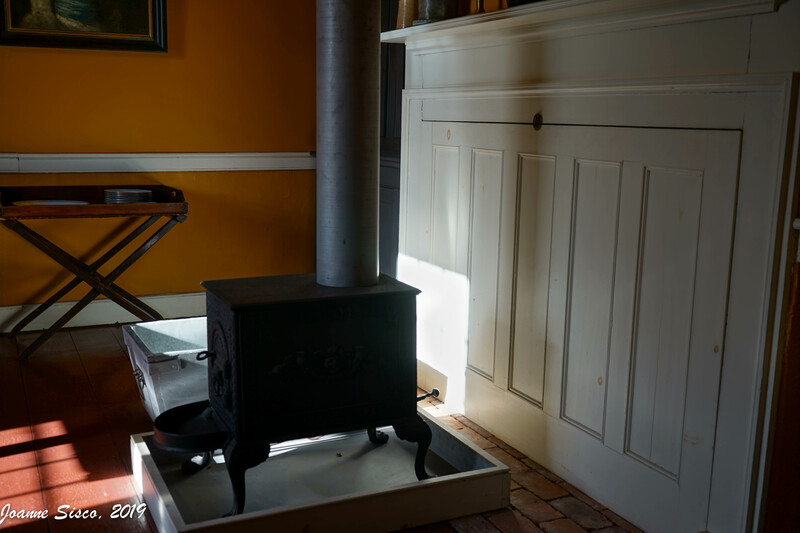 In the mid-1800s, the large original fireplaces in the officers’ quarters were blocked off and replaced with more efficient wooden stoves. I like that there is a door on the fireplace so that it can still be accessed rather than simply boarded up. hmmm – I wonder if they are using it for storage? 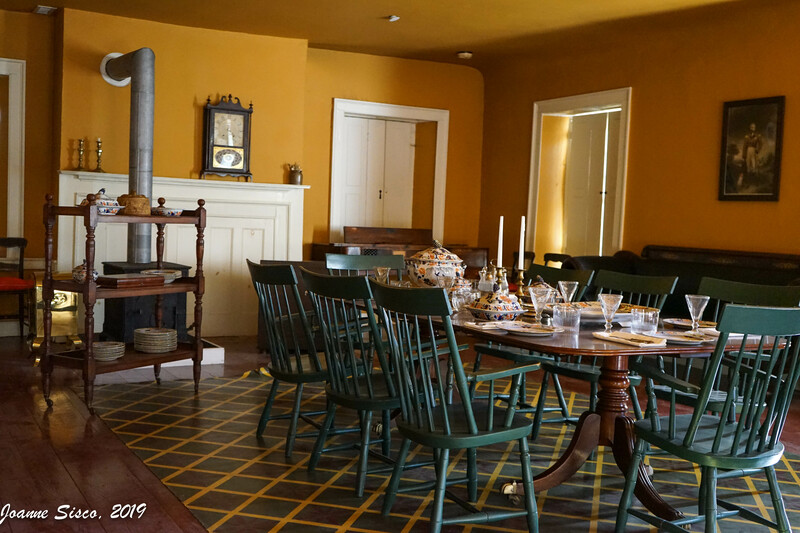 The original kitchen was located under the officers’ dining room, but was relocated to an addition onto the building in the mid-1800s. Apparently the officers didn’t like the noise coming from the kitchens below while they enjoyed their evening meal. 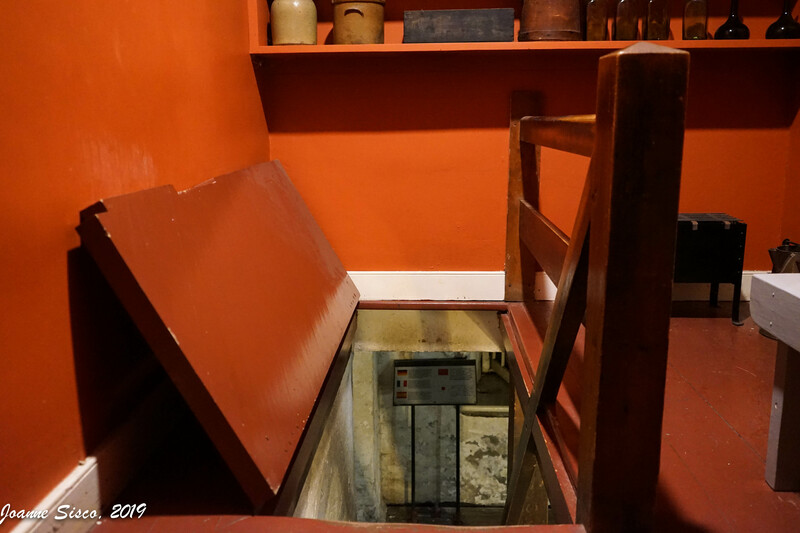 I didn’t particularly want to venture down the steep and narrow stairs to the original kitchen, but what kind of intrepid explorer would I be if I didn’t? 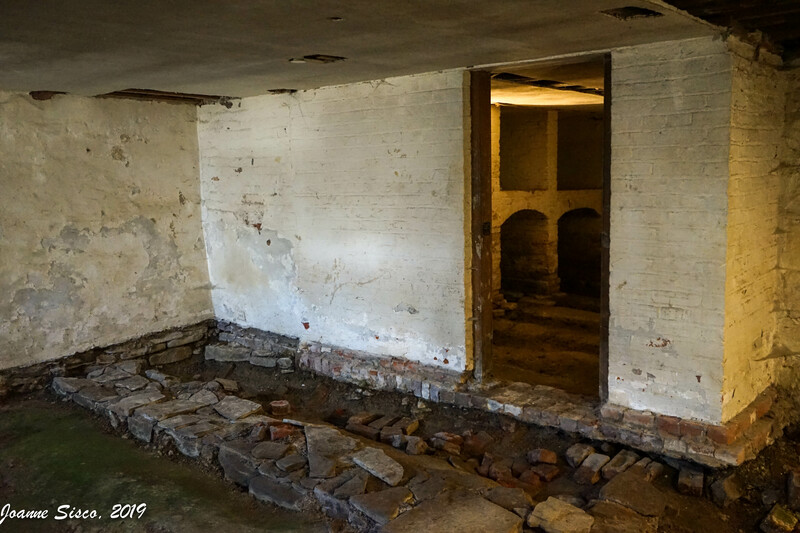 The basement is currently in a state of disrepair – not sure if it’s being restored or not – as it was largely blocked off from venturing too far from the stairs. Just as well in my opinion. Again – I’ve seen too many horror stories to be comfortable poking around a dark basement. So although my tour of Fort York didn’t include any of the demonstrations that normally occur during high season with people in period costumes, I found my visit to be fascinating. The gates are open and visitors are welcome! 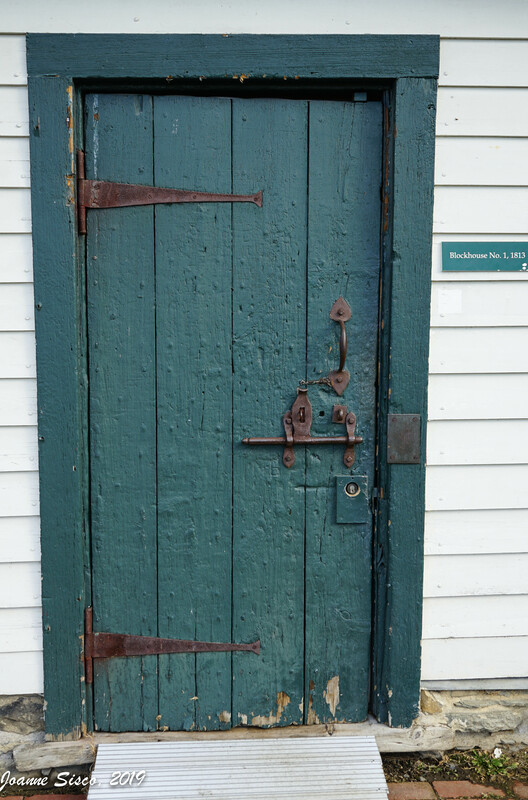 This post was inspired by Thursday Doors – a weekly photo feature hosted by Norm 2.0. Thanks for taking us to Fort York, Joanne. I enjoyed the photos and history, and smiled at the cannons aimed at the freeway. Beautiful old place. Where I live, we also have similar places like that. Some of those places have abandoned armed tanks, fighter jets and canons used in second world war. I always love that kinda places when the surroundings are calm. That would be so interesting to visit! I don’t know why, but I do have a fascination with tanks. I have always enjoyed exploring historical buildings and sites. Thanks for the tour. I’m sure it’s more ‘entertaining’ with people in costumes and all that. However, I like that you’re experiencing the space of the place and I appreciate you taking us with you. These places are like time travel. That’s actually a great way to look at it – time travel. I guess that’s the closest we will ever come to it! I do love that fireplace door and the last one had me puzzled for a bit before I realized it’s one of the entrance gates – I assume. It’s surprising how a number of major North American cities waterfront areas are at least partially built on landfill. Chicago, Toronto, Boston, NYC, even parts of the old port of Montreal were filled in and built-over. And thanks for the continued in-depth tour of the Fort. It is definitely moving up on my list of priorities for my next trip to Toronto. You’re right, Norm. The last photo is the front gate, although the back gate I posted last week is the same style of door. Although I knew the harbour area had been built up, I didn’t know that Fort York used to be stilling on a 10-metre high cliff overlooking the water. What I don’t understand is why. I suspect loading and unloading of ships had a lot to do with it. So many historical gems to discover. You are becoming a history treasure hunter! Seriously! You would have been left wondering what was down those stairs. Wow, love that last one. Such character. Aren’t the old forts wonderful? Blockhouse No.1—I love everything about that door. Can you imagine lugging dishes up and down those kitchen/basement stairs?! What the officers heard was probably the staff cussing them out!! bwahahaha! So true. I wondered how many times someone had fallen on those stairs! How brave of you! I doubt I would have gone into that basement. It is bittersweet to see how shorelines change. I agree with you about the shoreline changes. On one hand, it is a marvel of engineering, but I’m also increasingly sensitive to man’s tendency to manipulate nature for his own purpose … and not all of it good. I am officially adding this to my “must see” list of I make it back to Toronto. Maybe I’ll try to avoid that expressway with my CT license plates. I wouldn’t want to attract cannon fire. I love the green door and the door within the gate. The Americans are Coming! The Americans are Coming! “The Americans are coming (hide the beer).” I enjoyed Toronto, and I enjoyed Montreal, although it was over 35 years ago when I last visited there. I hope to get back to both cities. AMTRAK says they are considering extending the Vermonter back to the Montrealer. These days, the only train is the Adirondack, which is plagued by delays. I would probably drive to Toronto. If / when you do decide to head north, you must let me know. There will be beer 🙂 … oh yeah, and some doors! Wow. The landscape has changed quite a bit. It’s not even recognizable. And the old kitchen looks like a catacomb! Ha ha. I can understand why you didn’t poke around. But the hinged latch covering the stairs is pretty cool. Thanks for sharing your adventure, Joanne. 🙂 Happy Travels. Catacomb is a great word to describe it … although the first word that came to mind for me was ‘crypt’. By this point, my imagination as running wild. The door over the stairs really creeped me out. I had visions of being locked down there. Hi Joanne. I really liked the Blockhouse 1 door. This is a fascinating place. Your photos are fantastic. I get what you mean about the sketch — or rather how that feels. I hate when something just feels off. It wiggles into the brain and sticks around tenaciously. With me, I usually can’t get any confirmation, and often can’t even pinpoint exactly what it is — except that it’s just wrong somehow. But nothing wrong with it being Friday. TGIF hugs! That’s exactly how it feels – it wiggles into the brain and irritates it. I do like looking at old photos of familiar places and playing that game of ‘what’s different’. Boston is like Toronto, apparently, in the respect that it is largely built on fill. In colonial days it was almost an island connected by a narrow neck. In fact, in the 1800s a big hill in my hometown of Needham about 10 miles outside of the city was razed and hauled into Boston to make more land. So those old drawings are disorienting for a reason. I didn’t know that about Boston. I suspect that many old North American cities can say the same thing. Beautiful pix. I’m not sure how wise it is to build over an old landfill. If I lived in that city, I think I’d learn my geographical history well. I used ‘landfill’ in a rather generic form rather than its use to mean garbage. My bad. I loved that colour too … however I don’t know how much of the colour scheme is a reflection of the time. Beautiful images Joanne 🙂 You’re description of Toronto sounds a lot like how the land mass of Manhattan was extended by using ground oyster shells. I find this kind of stuff so interesting. I guess I shouldn’t be surprised that Manhattan went through a similar transformation. I love that you continue to explore your neighbourhood & the history associated with each little gem you manage to uncover. Well done! Thanks Lynn. The more I learn, the more interesting I find history. The creepiest place is crying to be in a movie. 🙂 Great pictures and very interesting history. Wonderful, Joanne! When I was young, my dad loved to take the family to old forts – I think we visited every one in Ontario. Your photos bring back those memories. I was bored by the marching and the other demonstrations (e.g. firing of canons and such), but this is probably where I first came to love old, historic buildings. Please talk to me. What do you think?